Agriculture isn’t new to southwest Iowa, but ag arts is. With fewer children growing up on a farm and more families living in cities and commuting to work, people eat faster and are less aware of where their food comes from. By using an interdisciplinary approach of science and art, participants can engage in a wide-range of fun and educational opportunities on farms. This can include learning about the importance of soil health from the farmer, then sculpting a pinch pot using the clay soil from that farm or taking a photo of farm landscape and composing a story. Ag arts promotes our rural area and supports our local farmers. Using art on farms can change our consciousness, making us more mindful of our food system. This summer, Golden Hills RC&D is coordinating seven ag arts camps in four southwest Iowa counties. These ag arts camps are offered to all ages and abilities, youth and senior clubs, homeschoolers, families, and more. We’re limited to 25 participants per camp, and reservations are filling quickly. Reservations are due by May 15. Unless otherwise specified, camps begin at 9 AM and run through 2 PM. Cost for the camp is $15 per person, which includes a healthy lunch. 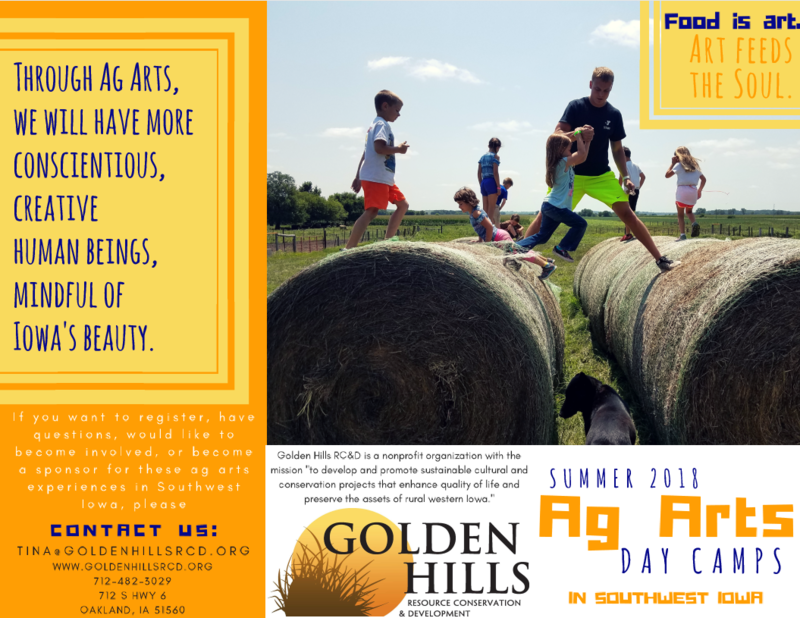 If you’re interested in attending an ag arts camp or sponsoring a camper or camp, please contact Tina Bakehouse at 712.482.3029 or Tina@goldenhillsrcd.org to make a reservation. Registration online is coming soon to our website: www.goldenhillsrcd.org or a check can be mailed to Golden Hills RC&D 712 S HWY St. PO Box 189 Oakland, IA 51560. Mention “Ag Arts” in the memo. Click here to download an Ag Arts Brochure. We are currently seeking sponsors for the program to help cover expenses and keep registration costs low. If you are interested in sponsoring, click here to learn more or contact Tina Bakehouse (tina@goldenhillsrcd.org/712-482-3029). 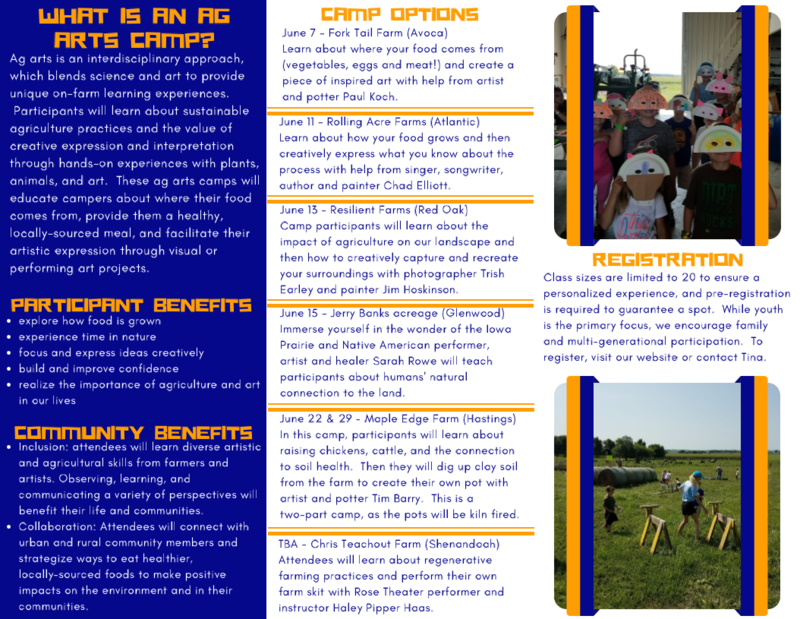 Register for an Ag Arts Camp!